SATIRE COMPOSED: Giorgio Coniglio, June 2018. The involved verses have been published at OEDILF.com, the online humour dictionary. OEDILF currently has a repertoire of over 100,000 carefully edited verses, with 'defined words' spanning the alphabet from A- as far as Go- (estimated date of completion: after 2070). 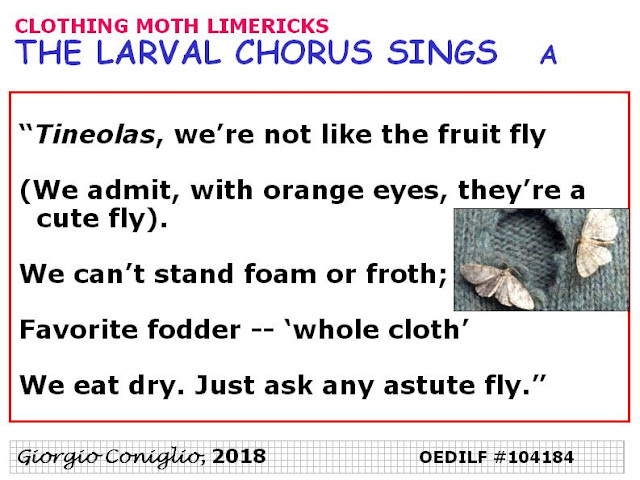 SONGLINK: The underlying concepts for these verses have also been adapted and set to music (in this case the theme used was 'the Mexican Hat Dance'. See the blogpost "Clothing Moth Hat-Dance" on our lyrics blog "SILLY SONGS and SATIRE".